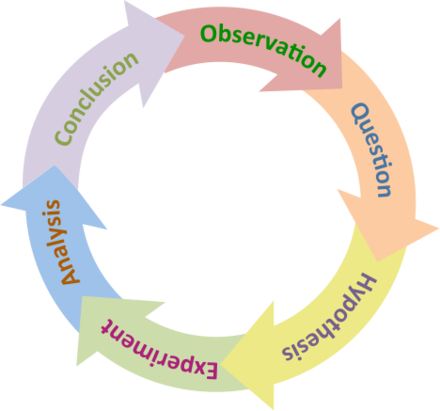 The scientific method is an empirical method of acquiring knowledge that has characterized the development of science since at least the 17th century. It involves careful observation, applying rigorous skepticism about what is observed, given that cognitive assumptions can distort how one interprets the observation. It involves formulating hypotheses, via induction, based on such observations; experimental and measurement-based testing of deductions drawn from the hypotheses; and refinement of the hypotheses based on the experimental findings. These are principles of the scientific method, as distinguished from a definitive series of steps applicable to all scientific enterprises. A statement, hypothesis, or theory has falsifiability if it is contradicted by a basic statement, which, in an eventual successful or failed falsification, must respectively correspond to a true or hypothetical observation. For example, the claim "all swans are white and have always been white" is falsifiable since it is contradicted by this basic statement: "In 1697, during the Dutch explorer Willem de Vlamingh expedition, there were black swans on the shore of the Swan River in Australia", which in this case is a true observation. The concept is also known by the terms refutable and refutability. The demarcation problem in the philosophy of science and epistemology is about how to distinguish between science and non-science, including between science, pseudoscience, and other products of human activity, like art and literature, and beliefs. The debate continues after over two millennia of dialogue among philosophers of science and scientists in various fields, and despite broad agreement on the basics of scientific method. An expert witness, in England, Wales and the United States, is a person whose opinion by virtue of education, training, certification, skills or experience, is accepted by the judge as an expert. The judge may consider the witness's specialized opinion about evidence or about facts before the court within the expert's area of expertise, referred to as an "expert opinion". Expert witnesses may also deliver "expert evidence" within the area of their expertise. Their testimony may be rebutted by testimony from other experts or by other evidence or facts. Pseudoscience can be harmful. Antivaccine activists present pseudoscientific studies that falsely call into question the safety of vaccines. 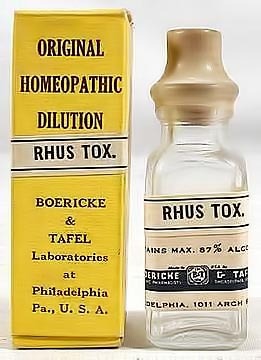 Homeopathic remedies with no active ingredients have been promoted as treatment for deadly diseases. James Pettit Andrews was an English historian and antiquary. François Magendie was a French physiologist, considered a pioneer of experimental physiology. He is known for describing the foramen of Magendie. There is also a Magendie sign, a downward and inward rotation of the eye due to a lesion in the cerebellum. Magendie was a faculty at the College of France, holding the Chair of Medicine from 1830 to 1855. Knowledge is a familiarity, awareness, or understanding of someone or something, such as facts, information, descriptions, or skills, which is acquired through experience or education by perceiving, discovering, or learning. Dividing the category again, unscientific claims are a subset of the large category of non-scientific claims. This category specifically includes all matters that are directly opposed to good science. Un-science includes both bad science (such as an error made in a good-faith attempt at learning something about the natural world) and pseudoscience. Thus pseudoscience is a subset of un-science, and un-science, in turn, is subset of non-science. 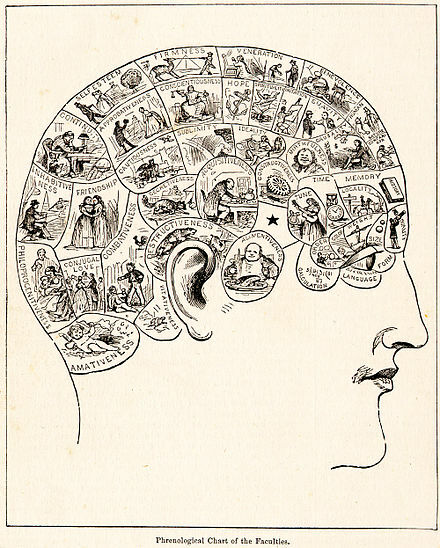 A typical 19th-century phrenology chart: During the 1820s, phrenologists claimed the mind was located in areas of the brain, and were attacked for doubting that mind came from the nonmaterial soul. Their idea of reading "bumps" in the skull to predict personality traits was later discredited. Phrenology was first termed a pseudoscience in 1843 and continues to be considered so. A number of basic principles are accepted by scientists as standards for determining whether a body of knowledge, method, or practice is scientific. Experimental results should be reproducible and verified by other researchers. These principles are intended to ensure experiments can be reproduced measurably given the same conditions, allowing further investigation to determine whether a hypothesis or theory related to given phenomena is valid and reliable. Standards require the scientific method to be applied throughout, and bias to be controlled for or eliminated through randomization, fair sampling procedures, blinding of studies, and other methods. All gathered data, including the experimental or environmental conditions, are expected to be documented for scrutiny and made available for peer review, allowing further experiments or studies to be conducted to confirm or falsify results. Statistical quantification of significance, confidence, and error  are also important tools for the scientific method. Another example which shows the distinct need for a claim to be falsifiable was stated in Carl Sagan's publication The Demon-Haunted World when he discusses an invisible dragon that he has in his garage. The point is made that there is no physical test to refute the claim of the presence of this dragon. No matter what test you think you can devise, there is then a reason why this does not apply to the invisible dragon, so one can never prove that the initial claim is wrong. Sagan concludes; "Now, what's the difference between an invisible, incorporeal, floating dragon who spits heatless fire and no dragon at all?". He states that "your inability to invalidate my hypothesis is not at all the same thing as proving it true",  once again explaining that even if such a claim were true, it would be outside the realm of scientific inquiry. For philosophers Silvio Funtowicz and Jerome R. Ravetz "pseudo-science may be defined as one where the uncertainty of its inputs must be suppressed, lest they render its outputs totally indeterminate". The definition, in the book Uncertainty and quality in science for policy (p. 54),  alludes to the loss of craft skills in handling quantitative information, and to the bad practice of achieving precision in prediction (inference) only at the expenses of ignoring uncertainty in the input which was used to formulate the prediction. This use of the term is common among practitioners of post-normal science. Understood in this way, pseudoscience can be fought using good practices to assesses uncertainty in quantitative information, such as NUSAP and – in the case of mathematical modelling – sensitivity auditing. 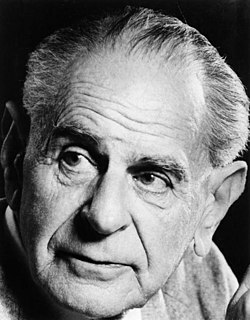 Karl Popper stated it is insufficient to distinguish science from pseudoscience, or from metaphysics (such as the philosophical question of what existence means), by the criterion of rigorous adherence to the empirical method, which is essentially inductive, based on observation or experimentation. He proposed a method to distinguish between genuine empirical, nonempirical or even pseudoempirical methods. The latter case was exemplified by astrology, which appeals to observation and experimentation. While it had astonishing empirical evidence based on observation, on horoscopes and biographies, it crucially failed to use acceptable scientific standards. Popper proposed falsifiability as an important criterion in distinguishing science from pseudoscience. To demonstrate this point, Popper  gave two cases of human behavior and typical explanations from Sigmund Freud and Alfred Adler's theories: "that of a man who pushes a child into the water with the intention of drowning it; and that of a man who sacrifices his life in an attempt to save the child." From Freud's perspective, the first man would have suffered from psychological repression, probably originating from an Oedipus complex, whereas the second man had attained sublimation. From Adler's perspective, the first and second man suffered from feelings of inferiority and had to prove himself, which drove him to commit the crime or, in the second case, drove him to rescue the child. Popper was not able to find any counterexamples of human behavior in which the behavior could not be explained in the terms of Adler's or Freud's theory. Popper argued  it was that the observation always fitted or confirmed the theory which, rather than being its strength, was actually its weakness. In contrast, Popper  gave the example of Einstein's gravitational theory, which predicted "light must be attracted by heavy bodies (such as the Sun), precisely as material bodies were attracted." Following from this, stars closer to the Sun would appear to have moved a small distance away from the Sun, and away from each other. This prediction was particularly striking to Popper because it involved considerable risk. The brightness of the Sun prevented this effect from being observed under normal circumstances, so photographs had to be taken during an eclipse and compared to photographs taken at night. Popper states, "If observation shows that the predicted effect is definitely absent, then the theory is simply refuted." Popper summed up his criterion for the scientific status of a theory as depending on its falsifiability, refutability, or testability. Science is also distinguishable from revelation, theology, or spirituality in that it offers insight into the physical world obtained by empirical research and testing. 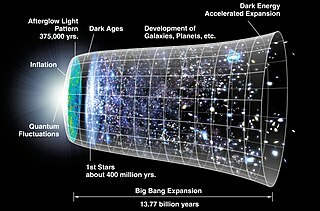 The most notable disputes concern the evolution of living organisms, the idea of common descent, the geologic history of the Earth, the formation of the solar system, and the origin of the universe. Systems of belief that derive from divine or inspired knowledge are not considered pseudoscience if they do not claim either to be scientific or to overturn well-established science. Moreover, some specific religious claims, such as the power of intercessory prayer to heal the sick, although they may be based on untestable beliefs, can be tested by the scientific method. Some statements and common beliefs of popular science may not meet the criteria of science. "Pop" science may blur the divide between science and pseudoscience among the general public, and may also involve science fiction. Indeed, pop science is disseminated to, and can also easily emanate from, persons not accountable to scientific methodology and expert peer review. Failure to make use of operational definitions (i.e., publicly accessible definitions of the variables, terms, or objects of interest so that persons other than the definer can measure or test them independently) [Note 4] (See also: Reproducibility). Presentation of data that seems to support claims while suppressing or refusing to consider data that conflict with those claims. This is an example of selection bias, a distortion of evidence or data that arises from the way that the data are collected. It is sometimes referred to as the selection effect. Lack of self-correction: scientific research programmes make mistakes, but they tend to reduce these errors over time. By contrast, ideas may be regarded as pseudoscientific because they have remained unaltered despite contradictory evidence. The work Scientists Confront Velikovsky (1976) Cornell University, also delves into these features in some detail, as does the work of Thomas Kuhn, e.g., The Structure of Scientific Revolutions (1962) which also discusses some of the items on the list of characteristics of pseudoscience. Creating scientific-sounding terms to persuade nonexperts to believe statements that may be false or meaningless: For example, a long-standing hoax refers to water by the rarely used formal name "dihydrogen monoxide" and describes it as the main constituent in most poisonous solutions to show how easily the general public can be misled. "A pretended or spurious science; a collection of related beliefs about the world mistakenly regarded as being based on scientific method or as having the status that scientific truths now have," Oxford English Dictionary , second edition 1989. ↑ For an opposing perspective, e.g. Chapter 5 of Suppression Stories by Brian Martin (Wollongong: Fund for Intellectual Dissent, 1997), pp. 69–83. ↑ e.g. archivefreedom.org, which claims that "The list of suppressed scientists even includes Nobel Laureates!" ↑ e.g. Philosophy 103: Introduction to Logic Argumentum Ad Hominem. In philosophy of science, there are several definitions of protoscience. Paul Karl Feyerabend was an Austrian-born philosopher of science best known for his work as a professor of philosophy at the University of California, Berkeley, where he worked for three decades (1958–1989). At various different points in his life, he lived in England, the United States, New Zealand, Italy, Germany, and finally Switzerland. His major works include Against Method, Science in a Free Society and Farewell to Reason. Feyerabend became famous for his purportedly anarchistic view of science and his rejection of the existence of universal methodological rules. He was an influential figure in the sociology of scientific knowledge. Asteroid (22356) Feyerabend is named in his honour. Paul Thagard is a Canadian philosopher who specializes in cognitive science, philosophy of mind, and the philosophy of science and medicine. Thagard is distinguished professor emeritus of Philosophy at the University of Waterloo. Thagard is a prolific writer, and has contributed to research in analogy and creativity, inference, cognition in the history of science, and the role of emotion in cognition. Inductivism is the traditional model of scientific method attributed to Francis Bacon, who in 1620 vowed to subvert allegedly traditional thinking. In the Baconian model, one observes nature, proposes a modest law to generalize an observed pattern, confirms it by many observations, ventures a modestly broader law, and confirms that, too, by many more observations, while discarding disconfirmed laws. The laws grow ever broader but never much exceed careful, extensive observation. Thus, freed from preconceptions, scientists gradually uncover nature's causal and material structure. Theory choice was a main problem in the philosophy of science in the early 20th century, and under the impact of the new and controversial theories of relativity and quantum physics, came to involve how scientists should choose between competing theories. Epistemological anarchism is an epistemological theory advanced by Austrian philosopher of science Paul Feyerabend which holds that there are no useful and exception-free methodological rules governing the progress of science or the growth of knowledge. It holds that the idea of the operation of science by fixed, universal rules is unrealistic, pernicious, and detrimental to science itself. Bold hypothesis is a concept in the philosophy of science of Karl Popper, first explained in his debut The Logic of Scientific Discovery (1935) and subsequently elaborated in writings such as Conjectures and Refutations: The Growth of Scientific Knowledge (1963). The concept is nowadays widely used in the philosophy of science and in the philosophy of knowledge. It is also used in the social and behavioural sciences. 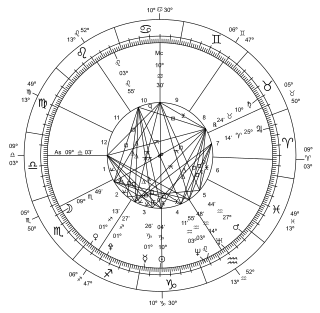 Astrology consists of a number of belief systems that hold that there is a relationship between astronomical phenomena and events or descriptions of personality in the human world. Astrology has been rejected by the scientific community as having no explanatory power for describing the universe. Scientific testing has found no evidence to support the premises or purported effects outlined in astrological traditions. A non-science is an area of study that is not scientific, especially one that is not a natural science or a social science that is an object of scientific inquiry. In this model, history, art, and religion are all examples of non-sciences. ↑ Frietsch U (7 April 2015). "The boundaries of science / pseudoscience". European History Online (EGO). Archived from the original on 15 April 2017. Retrieved 15 April 2017. ↑ "Online Etymology Dictionary". Douglas Harper. 2015. 1 2 Magendie F (1843). An Elementary Treatise on Human Physiology. John Revere (5th ed.). New York: Harper. p. 150. Magendie refers to phrenology as "a pseudo-science of the present day"
↑ Still A, Dryden W (2004). "The Social Psychology of "Pseudoscience": A Brief History". J Theory Soc Behav. 34 (3): 265–90. doi:10.1111/j.0021-8308.2004.00248.x. 1 2 3 4 Hansson, Sven Ove (2017). Zalta, Edward N. (ed.). The Stanford Encyclopedia of Philosophy (Summer 2017 ed.). Metaphysics Research Lab, Stanford University. ↑ Bunge, Mario Augusto (1998). Philosophy of Science: From Problem to Theory. Transaction Publishers. p. 24. ISBN 978-0-7658-0413-6. ↑ Bowler J (2003). Evolution: The History of an Idea (3rd ed.). University of California Press. p. 128. ISBN 978-0-520-23693-6. ↑ Gauch (2003) , pp. 191 ff, especially Chapter 6, "Probability", and Chapter 7, "inductive Logic and Statistics"
1 2 3 Popper K (1959). The Logic of Scientific Discovery. Routledge. ISBN 978-0-415-27844-7. The German version is currently in print by Mohr Siebeck ( ISBN 3-16-148410-X). ↑ Casti JL (1990). Paradigms lost: tackling the unanswered mysteries of modern science (1st ed.). New York: Avon Books. pp. 51–52. ISBN 978-0-380-71165-9. ↑ Novella, Steven, et al. The Skeptics' Guide to the Universe: How to Know What's Really Real in a World Increasingly Full of Fake. Grand Central Publishing, 2018. pp. 165. ↑ Feyerabend P (1975). "Table of contents and final chapter". Against Method: Outline of an Anarchistic Theory of Knowledge. ISBN 978-0-86091-646-8. Archived from the original on 2007-12-12. ↑ Laudan L (1996). "The demise of the demarcation problem". In Ruse M (ed.). But Is It Science? : The Philosophical Question in the Creation/Evolution Controversy. pp. 337–350. ↑ McNally RJ (2003). "Is the pseudoscience concept useful for clinical psychology?". The Scientific Review of Mental Health Practice. 2 (2). Archived from the original on 2010-04-30. ↑ Funtowicz S, Ravetz J (1990). Uncertainty and quality in science for policy. Dordrecht: Kluwer Academic Publishers. ↑ "Pseudoscience". The Skeptic's Dictionary. Archived from the original on 2009-02-01. ↑ Greener M (December 2007). "Taking on creationism. Which arguments and evidence counter pseudoscience?". EMBO Reports. 8 (12): 1107–9. doi:10.1038/sj.embor.7401131. PMC 2267227 . PMID 18059309. 1 2 3 4 5 6 7 8 9 Popper K (1963). Conjectures and Refutations (PDF). Archived (PDF) from the original on 2017-10-13. ↑ Gould SJ (March 1997). "Nonoverlapping magisteria". Natural History. No. 106. pp. 16–22. Archived from the original on January 4, 2017. ↑ "Royal Society statement on evolution, creationism and intelligent design" (Press release). London, UK: Royal Society. 11 April 2006. Archived from the original on October 13, 2007. ↑ Pendle G. "Popular Science Feature – When Science Fiction is Science Fact". Archived from the original on 2006-02-14. ↑ e.g. Gauch (2003) , pp. 211 ff (Probability, "Common Blunders"). ↑ Churchland PM (1999). Matter and Consciousness: A Contemporary Introduction to the Philosophy of Mind. MIT Press. p. 90. ISBN 9780262530743. ↑ Gauch (2003) , pp. 269 ff, "Parsimony and Efficiency"
1 2 Hines T (1988). Pseudoscience and the Paranormal: A Critical Examination of the Evidence. Buffalo, NY: Prometheus Books. ISBN 978-0-87975-419-8. ↑ Donald E. Simanek. "What is science? What is pseudoscience?". Archived from the original on 2009-04-25. 1 2 Lakatos I (1970). "Falsification and the Methodology of Scientific Research Programmes". In Lakatos I, Musgrave A (eds.). Criticism and the Growth of Knowledge. pp. 91–195. ↑ Macmillan Encyclopedia of Philosophy Vol 3, "Fallacies" 174 ff, esp. section on "Ignoratio elenchi"
↑ Eileen Gambrill (1 May 2012). Critical Thinking in Clinical Practice: Improving the Quality of Judgments and Decisions (3rd ed.). John Wiley & Sons. p. 109. ISBN 978-0-470-90438-1. ↑ Gitanjali B (2001). "Peer review -- process, perspectives and the path ahead" (PDF). Journal of Postgraduate Medicine. 47 (3): 210–4. PMID 11832629. Archived from the original (PDF) on 2006-06-23. ↑ Stone S, Ng A. "American adults flunk basic science: National survey shows only one-in-five adults can answer three science questions correctly" (Press release). California Academy of Sciences. Archived from the original on October 18, 2013. ↑ Raloff J (21 February 2010). "Science literacy: U.S. college courses really count". Science News. Society for Science & the Public. Archived from the original on 13 October 2017. Retrieved 13 October 2017. ↑ Oswald T (15 November 2007). "MSU prof: Lack of science knowledge hurting democratic process". MSUToday. Michigan State University. Archived from the original on 11 September 2013. Retrieved August 28, 2013. ↑ Hobson A (2011). "Teaching relevant science for scientific literacy" (PDF). Journal of College Science Teaching. Archived from the original (PDF) on 2011-08-24. ↑ Impey C, Buxner S, et al. (2011). "A twenty-year survey of science literacy among college undergraduates" (PDF). Journal of College Science Teaching . 40 (1): 31–37. David W. Moore (June 16, 2005). "Three in Four Americans Believe in Paranormal". Archived from the original on 2010-08-22. ↑ National Science Board (February 2006). Science and Engineering Indicators 2006. Volume 1. Arlington, VA: National Science Foundation. ↑ National Science Board (February 2006). "Appendix table 7-16: Attitudes toward science and technology, by country/region: Most recent year". Science and Engineering Indicators 2006. Volume 2: Appendix Tables. Arlington, VA: National Science Foundation. p. A7–17. ↑ FOX News (June 18, 2004). "Poll: More Believe In God Than Heaven". Fox News Channel. Archived from the original on March 5, 2009. Retrieved Apr 26, 2009. ↑ Taylor H (February 26, 2003). "Harris Poll: The Religious and Other Beliefs of Americans 2003". Archived from the original on January 11, 2007. Retrieved Apr 26, 2009. ↑ Singer B, Benassi VA (January–February 1981). "Occult beliefs: Media distortions, social uncertainty, and deficiencies of human reasoning seem to be at the basis of occult beliefs". American Scientist. Vol. 69 no. 1. pp. 49–55. JSTOR 27850247. ↑ Eve RA, Dunn D (January 1990). "Psychic powers, astrology & creationism in the classroom? Evidence of pseudoscientific beliefs among high school biology & life science teachers" (PDF). The American Biology Teacher. Vol. 52 no. 1. pp. 10–21. doi:10.2307/4449018. Archived (PDF) from the original on 2017-10-13. ↑ Beyerstein B, Hadaway P (1991). "On avoiding folly". Journal of Drug Issues. 20 (4): 689–700. doi:10.1177/002204269002000418. ↑ Shermer M (July 2011). "Understanding the believing brain: Why science is the only way out of belief-dependent realism". Scientific American. Archived from the original on 30 August 2016. Retrieved 14 August 2016. ↑ Lindeman M (December 1998). "Motivation, cognition and pseudoscience". Scandinavian Journal of Psychology. 39 (4): 257–65. doi:10.1111/1467-9450.00085. PMID 9883101. ↑ Matute H, Blanco F, Yarritu I, Díaz-Lago M, Vadillo MA, Barberia I (2015). "Illusions of causality: how they bias our everyday thinking and how they could be reduced". Frontiers in Psychology. 6: 888. doi:10.3389/fpsyg.2015.00888. PMC 4488611 . PMID 26191014. ↑ Lack C (10 October 2013). "What does Scientific Literacy look like in the 21st Century?". Great Plains Skeptic. Skeptic Ink Network. Archived from the original on 13 April 2014. Retrieved 9 April 2014. ↑ Shermer M, Gould SJ (2002). Why People Believe Weird Things: Pseudoscience, Superstition, and Other Confusions of Our Time. New York: Holt Paperbacks. ISBN 978-0-8050-7089-7. 1 2 Matute H, Yarritu I, Vadillo MA (August 2011). "Illusions of causality at the heart of pseudoscience". British Journal of Psychology. 102 (3): 392–405. CiteSeerX 10.1.1.298.3070 . doi:10.1348/000712610X532210. PMID 21751996. 1 2 Bird A (2008). "The Historical Turn in the Philosophy of Science" (PDF). In Psillos S, Curd M (eds.). Routledge Companion to the Philosophy of Science. Abingdon: Routledge. pp. 9, 14. Archived (PDF) from the original on 2013-06-01. ↑ Gordin MD (2015). "That a clear line of demarcation has separated science from pseudoscience". In Numbers RL, Kampourakis K (eds.). Newton's Apple and Other Myths about Science. Harvard University Press. pp. 219–225. ISBN 9780674915473. ↑ Newbold D, Roberts J (December 2007). "An analysis of the demarcation problem in science and its application to therapeutic touch theory". International Journal of Nursing Practice. 13 (6): 324–30. doi:10.1111/j.1440-172X.2007.00646.x. PMID 18021160. ↑ Laudan L (1983). "The Demise of the Demarcation Problem". In Cohen RS, Laudan L (eds.). Physics, Philosophy and Psychoanalysis: Essays in Honor of Adolf Grünbaum. Boston Studies in the Philosophy of Science. 76. Dordrecht: D. Reidel. pp. 111–127. ISBN 978-90-277-1533-3. ↑ Makgoba MW (May 2002). "Politics, the media and science in HIV/AIDS: the peril of pseudoscience". Vaccine. 20 (15): 1899–904. doi:10.1016/S0264-410X(02)00063-4. PMID 11983241. ↑ Efthimiou (2006) , p. 4 — Efthimiou quoting Friedman: "We could dignify pseudoscience by mentioning it at all". ↑ Efthimiou (2006) , p. 4 — Efthimiou quoting Park: "The more serious threat is to the public, which is not often in a position to judge which claims are real and which are voodoo. ... Those who are fortunate enough to have chosen science as a career have an obligation to inform the public about voodoo science". ↑ The National Council Against Health Fraud (1994). "NCAHF Position Paper on Homeopathy". 1 2 Kaufman, Allison; Kaufman, James (2017). Pseudoscience: The Conspiracy Against Science. Cambridge, MA: MIT Press. p. 239. ISBN 9780262037426. ↑ Lack, Caleb; Rousseau, Jacques (2016). Critical Thinking, Science, and Pseudoscience: Why We Can't Trust Our Brains. New York: Springer Publishing Company, LLC. p. 221. ISBN 9780826194190. ↑ Lilienfeld, Scott; Lynn, Steven Jay; Lohr, Jeffrey (2014). Science and Pseudoscience in Clinical Psychology, Second Edition. New York: Guilford Publications. p. 435. ISBN 9781462517893. Bunge M (1983). "Demarcating science from pseudoscience". Fundamenta Scientiae . 3: 369–388. Devilly GJ (June 2005). "Power therapies and possible threats to the science of psychology and psychiatry". The Australian and New Zealand Journal of Psychiatry. 39 (6): 437–45. doi:10.1080/j.1440-1614.2005.01601.x. PMID 15943644. C.J. Efthimiou; R. Llewellyn (2006). "Is pseudoscience the solution to science literacy?". arXiv: physics/0608061 . Sager C, ed. (2008). "Voices for evolution" (PDF). National Center for Science Education. Retrieved 2010-05-21. Thagard, Paul R. (1978). "Why astrology is a pseudoscience". PSA: Proceedings of the Biennial Meeting of the Philosophy of Science Association. 1978 (1): 223–234. doi:10.1086/psaprocbienmeetp.1978.1.192639. ISSN 0270-8647. Shermer M (September 2011). "What Is Pseudoscience? : Distinguishing between science and pseudoscience is problematic". Scientific American: 92. Hansson SO (September 3, 2008). "Science and Pseudo-Science". Stanford Encyclopedia of Philosophy . Metaphysics Research Lab, Stanford University. Derksen AA (2001). "The seven strategies of the sophisticated pseudo-scientist: a look into Freud's rhetorical toolbox". J Gen Phil Sci. 32 (2): 329–350. doi:10.1023/A:1013100717113. Hansson SO (1996). "Defining pseudoscience". Philosophia Naturalis. 33: 169–176. Pratkanis AR (July–August 1995). "How to Sell a Pseudoscience". Skeptical Inquirer. 19 (4): 19–25. Archived from the original on 2006-12-11. Martin M (1994). "Pseudoscience, the paranormal, and science education". Science & Education. 3 (4): 1573–901. Bibcode:1994Sc&Ed...3..357M. doi:10.1007/BF00488452. Derksen AA (1993). "The seven sins of pseudo-science". J Gen Phil Sci. 24: 17–42. doi:10.1007/BF00769513. Little, John (October 29, 1981). "Review and useful overview of Gardner's book". New Scientist . 92 (1277): 320. Gardner M (1957). Fads and Fallacies in the Name of Science (2nd, revised & expanded ed.). Mineola, New York: Dover Publications. ISBN 978-0-486-20394-2. Originally published 1952 by G.P. Putnam's Sons, under the title In the Name of Science. Michael Shermer: Baloney Detection Kit on YouTube - 10 questions to challenge false claims and uncover the truth.